On September 22 next, Montres Breguet S.A. will join a major international charity project sponsored by the Association Mon'gasque contre les Myopathies , whose president is H.R.H. Prince Albert II of Monaco. A prestigious event called Only Watch 2005 will be staged in Monaco on that date under the high patronage of H.R.H. Prince Albert II. An exceptional auction sale of one-of-a-kind or first-in-a-series watches designed especially for the occasion will be staged for the benefit of the United Parent Project Muscular Dystrophy Association which finances medical research on genetic diseases, in particular Duche nne muscular dystrophy. The human cost, not least in children, of these cruel diseases has led Breguet to make a contribution of its own by designing and building in the finest craft traditions a limited series of seven watches, the first of which is being donated to the Only Watch 2005 auction sale. Designed in the grand tradition of the exclusive timepieces created by A.-L. Breguet himself for the Royal French Navy, the Marine 5817PR model's assertive personality displays an arresting mix of refinement and modern spirit. Numbered 1/7, its stunning case features a pink gold frame with bezel and back in platinum. Its elegant 18K gold dial plate with black rhodium finish is enhanced by a subtle wave pattern, engine turned by hand in the traditional manner. Facetted pink gold hands show the time on its silvered chapter ring's pink gold numerals. Chased entirely by an engraver's steady hand, the self -winding movement's decor alludes to the achievements of astronomers, navigators and explorers of the past in a fascinating display that includes a sailing ship, naval knots, navigational stars and instruments. Its dramatic good looks are due in part to the contrast between its dark, oxidized frame and its bright, pink gold oscillating weight designed like a sextant. Adding a trim contemporary note, this salute to the collection's early history comes with a sporty black rubber strap. Painstakingly finished and elaborately decorated by hand, the design's unique character embodies a full measure of respect for the centuries -old values and spirit underpinning Breguet's reputation. CASE: round, in pink gold, with fluted caseband; bezel and caseback in platinum. Caseback hand-engraved on a rose engine, with sapphire crystal, individually numbered from 1/7 to 7/7. Screw -locked crown. Welded, round-ended horns, screw-secured lugs. Water-resistant to 100 meters. 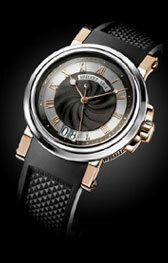 DIAL: black rhodium on 18K gold, engraved by hand on a rose engine; individually numbered and signed BREGUET. Pink gilt applied Roman numeral s. Center seconds hand. Large date calendar at 6 o'clock. Hollow -tip Breguet hands in gold, inlaid with a luminescent compound. MOVEMENT: self -winding, numbered and signed BREGUET. Entirely chased with relievo engraving and blackened by oxidation to repr esent traditional sailing themes: a sailing ship, celestial bodies (sun, North Star, constellations), naval rope knots, wind rose and names of astronomers, navigators and explorers. Cal. 517GG, 11'lignes, 35 jewels. 65-hour power reserve. Oscillating weight in 18K pink gold shaped like a ship's sextant. 4 Hz frequency. Straight -line lever escapement. Monometallic balance. Adjusted in 5 positions.